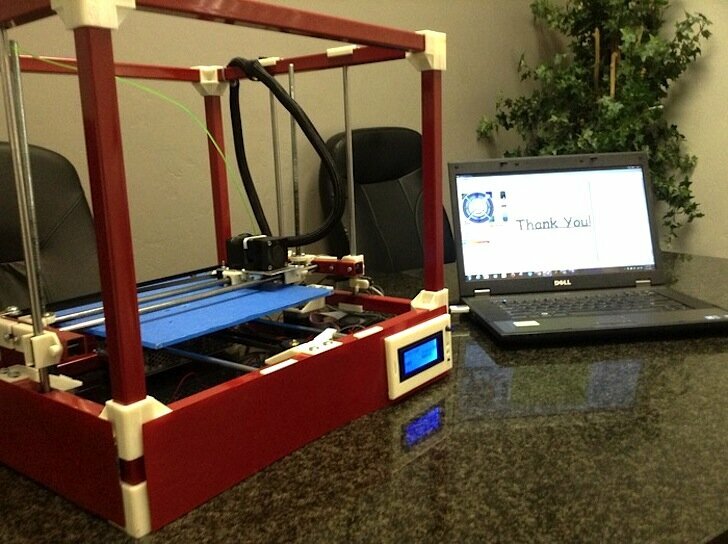 If you’re trying to launch a 3D printer, Kickstarter seems the place to go. There’s a new printer on the block and it will be the ninth successful Kickstarted printer we’ve covered. The reason they’ve all been successful is because they all bring something unique to the table, whether that be portability, faster speed, higher quality, lower price, or a smaller footprint; the RigidBot plays on three of the most important factors: quality, build volume, and price. What’s more, it’s expandable in every direction! The RigidBot is named for its steel bar construction, but what makes it so special are the injection molded plastic joints that hold the frame together. They’re easily removed, allowing for longer bars to be added. It’s likely that you won’t need to extend the build area though, as the smaller version has a 10” x 10” x 10” envelope (more than twice the volume of the Replicator 2), and the Big version provides a whopping 12” x 16” x 10” of build space. That’s a lot of 3D print. Since the focus is on build volume and affordability, the build plate isn’t heated, so PLA and wood filament are recommended; the electronics support a heated plate if you want to install your own. The RigidBot is also offered as a kit and fully assembled in both sizes. The kits started at $299, but they’re all gone at that tier. There are a few left for $330. You can still get a fully assembled one for $450. The Big kits are still available for $530, and fully assembled for $730. All versions can have LCD screens with sD card readers added for $125 (kit) or $175 (assembled). The campaign met its goal on the first day, and it’s currently at $283,000. This printer not only competes with the most popular MakerBot Replicator 2, but also with the most affordable fully assembled Solidoodle printers.